Starter of a revolution, maybe, but not great at fighting on the Rift. 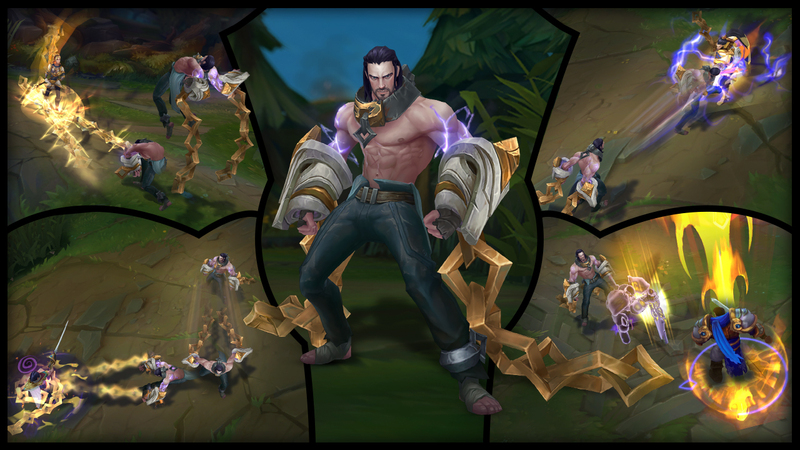 It’s a crime to think that someone with abs as chiseled as Sylas could possibly be weak, but that’s the grim reality we’re living in at the moment. The poor lad is struggling in the current League of Legends meta, and we don’t think yesterday’s hotfix is nearly enough to save him. Just in case you missed the specifics of the hotfix yesterday, all it did was raise his base AD from 55 to 58, his MR per level by 0.75, and the base damage on his E by 20. His winrates in each role were consistently sub-40 percent, which is exceptionally low even for a new champion, and three AD isn’t going to fix that. So what exactly is the issue with Sylas? Riot could simply buff all of his damage or lower all of his cooldowns, but right now, the issue lies within his design. To put it simply, his design contradicts itself, and it’s put him in a strange spot right after release. Sylas’ damage comes from fairly high AP scalings, as his base damage isn’t very remarkable. That wouldn’t be a problem, except he was pitched as a sort of AP bruiser. His abilities force him to get right up into the face of the enemy to get his hands dirty, and he doesn’t have the tools required to get out of the fight or to lock an enemy down for extended periods of time. So when he goes in, they can just turn around and attack him fairly easily. In other words, he has to be able to either survive the fight for long enough, or he has to kill them before they kill him. Right now, he can’t do either very well. If you build defensive to help him survive those up-close encounters, he won’t get enough AP to scale and burst people down upon engaging. And if you build too much AP, you’ll lack the defenses needed to survive for more than a second or two in a late-game skirmish. It’s a tight spot to be in, and to truly fix the problem, Riot needs to help one of those two playstyles. If the design team truly wants him to be a bruiser or an AP juggernaut of sorts, his base damage needs to be raised while his scalings are lowered a bit. That way, he’ll be able to remain effective while tanking up. On the other side, Riot could buff his scalings and commit to him being an AP assassin, which seems to be what most players have favored since his release. Most of his builds involve an early Luden’s Echo or Morellonomicon followed immediately by a Lich Bane. There isn’t much bruisery about that. It’s raw damage. Either way, something needs to be done, because Sylas is definitely undertuned. Hopefully his winrates climb a bit as more players get the hang of him, but a buff in the right spot could go a long way.